Traditional tooth replacement methods only restore those portions of patients’ teeth visible when they smile. While restoring these surface level parts of the smile is essential, the not replaced root structures can lead to a number of oral health concerns including further tooth loss. Because dental implant supported tooth replacement restores the entire tooth roots and all, the results look and feel more natural. Contact Friendswood Dental Group to schedule your implant dentistry consultation near League City today. Dr. Sierra could use a fixed bridge or partial denture to fill in your teeth. So, why does he prefer dental implants? Because unlike other prosthetics that only rest on top of your gums, a dental implant stands in for an entire tooth from root to crown. Therefore, it more closely mimics the form and function of a natural tooth. You will once again have a complete smile and you’ll be able to speak with confidence and eat a variety of foods in order to maintain a nutritious diet. 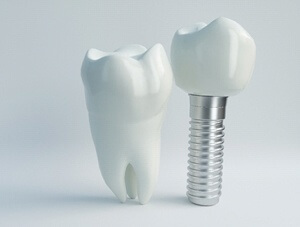 All the while, dental implants remain firmly in place and have no impact on the adjacent teeth. In addition, because dental implants are surgically positioned in your jawbone, they help support your facial structure. When you are missing a tooth, there is also a missing root. As a result, your jawbone won’t receive the stimulation it needs to build healthy new bone tissue. Subtle changes in the shape of your jaw could make your face look less full and older. Regardless of the number of missing teeth, the dental implant process begins with the placement of one or more dental implant posts below the gum line. A minor surgical procedure, the placement process is relatively straightforward. We make a small incision in the gum line and insert the implant. Over the course of several months, the supportive alveolar bone and gum tissue attaches to the implant post closely mimicking the natural root structure. This process known as osseointegration is what makes dental implant supported tooth replacement so effective. For those patients missing between one and four consecutive teeth, we will recommend an implant-supported dental crown or fixed bridge. 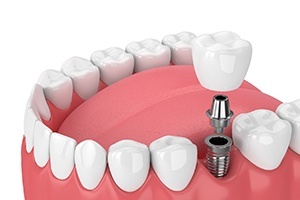 For single tooth replacement, a custom dental crown is affixed to a single dental implant. In most cases, patients missing two consecutive teeth will also affix the restoration to a single dental implant. Three or four missing teeth will be supported by two dental implants to anchor both sides of the fixed bridge. Each restoration is crafted on an individual basis in order to provide the ideal shape and support for replacement teeth. Patients missing numerous nonconsecutive teeth and those who need to replace a full arch of teeth will likely need an implant-retained partial or full denture. Implant supported partial dentures are similar to traditional partials. Crafted from a series of teeth set into a gum colored base, a strategically placed set of implant posts are used to support the partial which fills the gaps in patients’ smiles flawlessly while preserving healthy teeth. For those whose tooth loss is more advanced, a full denture may be the right option. In some cases, we’re able to modify patients’ existing dentures to be fitted over dental implants. Regardless, a full arch of replacement teeth is set into a gum-colored base which is then attached to dental implants. Both partial and full implant-retained dentures are available in fixed or removable options. Many patients who have been unable to replace missing teeth with dental implants due to lack of jawbone density, All-on-4 offers an effective option. Rather than placing a number of dental implants across the entire expanse of the jawbone, All-on-4 relies on the naturally denser portion of the jaw at the front to support the entire restoration. Typically using just 4 implants as the name suggests, two implant posts are positioned to anchor the front of the arch, and two posts are angled toward the back to support the back part of the restoration. Many dentists refer patients to oral surgeons for the placement of one or more dental implants. At Friendswood Dental Group, our dentists have advanced training in 3D Cone Beam surgical guided implant placement. That means patients are able to get the same safe, effective dental implant placement in the comfort of the dental practice they are already familiar with from the team they trust. 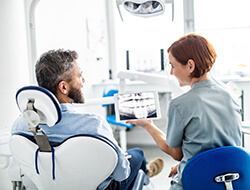 3D guided dental implants are just one more way we use state-of-the-art dentistry technologies to make our patients’ dental care more comfortable and convenient. How much your dental implants will cost depends on several factors. First, the number of implants required to restore your smile will influence Dr. Sierra’s fee. Also, whether you need a single dental crown, a bridge or an implant-retained denture is a factor. Regardless of the number of implants and the type of restoration, you need to keep in mind that dental implants are an investment that will last for decades when you practice good oral hygiene and attend regular dental checkups. And with a 98 percent success rate, dental implants are truly and excellent way to rebuild your smile.